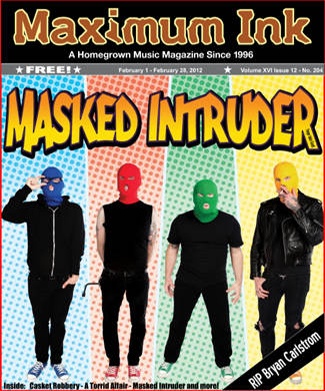 Upbeat pop-punk that’s fast, catchy, and clever, Madison’s MASKED INTRUDER has made a massive impact on the Midwestern punk scene in just a short time. Doo-wop harmonies meet beefy guitars meet memorable songs that you can sing and clap along to. These four alleged hoodlums’ real identities are kept secret to keep the fuzz off their backs and you can only tell them apart by the color of their face masks. With Orange on bass, Red on drums, Blue sings, and Green on guitar, they released their self-titled debut on Chicago’s Red Scare punk label just last August and were quickly picked up by Fat Wreck Chords (NOFX, DESCENDENTS, SCREECHING WEASEL), hitched on a tour with TEENAGE BOTTLEROCKET, and are preparing for a huge 2013. The guard let us have 15 minutes through the glass with Intruder Green and we talked about what’s coming up for the band this year. Maximum Ink: You guys have had a lot of success lately, especially with the Fat Wreck Chords signing, how did Fat Mike find you in the first place? Intruder Green: I think it was our buddy Toby of Redscare Industries, who originally signed us, that got him a copy of the album. Toby used to work for Fat Mike at Fat Wreck Chords before he started Redscare so there always seems to be some connection with Fat bands and Redscare bands. I guess Mike heard about us being on tour with Teenage Bottle Rocket and how good our show at the Fest in Gainesville was and decided to bring us on at least partially because of that. MI: What were bands that you guys gelled on as musicians? IG: We’re all about the same age so we’re into a lot of 90s pop-punk. It’s hard to name any one band that we all like the most. My favorite is Green Day because they seriously changed everything and, you know, they have a good name. We also just like a lot of radio pop music. Also, Katy Perry is really pretty. Also, so is Beyonce. Now that we’re on Fat we’re really hoping we’ll get to meet the Donnas someday and maybe they’ll think we’re as cute as we think they are hot. We also really like their tunes. MI: What was the initial inspiration behind the gimmick? Was it for a one-off show or for a party? MI: How did you guys come up with it? IG: It’s just real hard bein’ chased all the time when everybody knows what you look like. Wearin’ a mask makes it much easier to avoid the cops who are just always out to get us. It’s like, I didn’t do nothin’ wrong, but try tellin’ them that. MI: What do you think is the perfect song for people to listen to for their first Masked Intruder experience and why? IG: Personally, I think “How Do I Get to You” is like the best song to show people what we’re all about. Most of our songs are all about love, but the main point is that it’s just real hard to get girls to like you these days. You know, you try to be all romantic and like surprise them by giving them flowers as soon as they get home, and they get mad at you and call the cops. It makes it very difficult to actually meet them. MI: What song do you think best represents you guys’ vision for the band from the latest recording and what inspired it? IG: Whoa, that’s a tough question. I think a song that best describes what we think about when we’re writing songs though, is “Crazy”. ‘Cuz that’s how girls make us feel. And, you know, it’s cool to get money, so “Stick ‘em Up” is also a good one. MI: How has the experience been, moving from local Madison shows to national tours? Is it what you expected? IG: We did some of our own DIY type tours earlier on, so we’re used to the traveling and all that. It’s nice to have more people coming to the shows now though. It keeps us from having to get money by other means, if you know what I mean. Like robbing liquor stores… Allegedly. MI: What’s been your favorite show so far? What happened there that made it one for the books? IG: There’s been a lot of great shows. Our show at Fest was probably our favorite. It was the first show we had Maura from Mixtapes sing “Heart Shaped Guitar” with us. She sings it on the album and they were also playing at Fest, so it made sense to have her sing it on stage with us. But the place was so packed that she had to get body passed up to the stage. So that was pretty cool. Also, just recently we played a wrestling festival put on by Arik Cannon in Minneapolis. That was really cool. I got to get in the ring. MI: What are your plans for the rest of the year and into the Spring? I read about the new album in 2013, what’s going on with that? IG: We’re doing a bunch of touring. Possibly going to Europe. And we really want to make another album soon. It’s hard to make time for everything though, so we’ll see. Our next tour starts in February, and it’s going to be with Teenage Bottlerocket and the Queers. MI: What are the worst crimes you guys have ever committed? IG: I’m supposed to answer that question a certain way. Um… We never did nothin’. Why? What did you hear and who told you? MI: With the new-found success and an expanding fanbase, do you guys wish you wouldn’t have the masks on, so more people recognize you? IG: Whoa… that would be weird. But it’s like, if people don’t like us for who we are, then that’s their problem. Plus we look very handsome. With the masks, I mean. MI: What can people expect from a Masked Intruder live home invasion? IG: They can expect to have a great time. We like to party almost as much as we like crime… I mean, pretend I said something else there. Allegedly. Anyway, if you come to our shows, you will always have a safe place to put your wallet and purse. You can just leave it backstage so you don’t have to worry about losing it while partying in the crowd. Also, I’d like to put out a certain political message that’s very important to us. Legalize crime. It’s a bipartisan issue.